It doesn’t have to cost the earth to call the other side of the world. 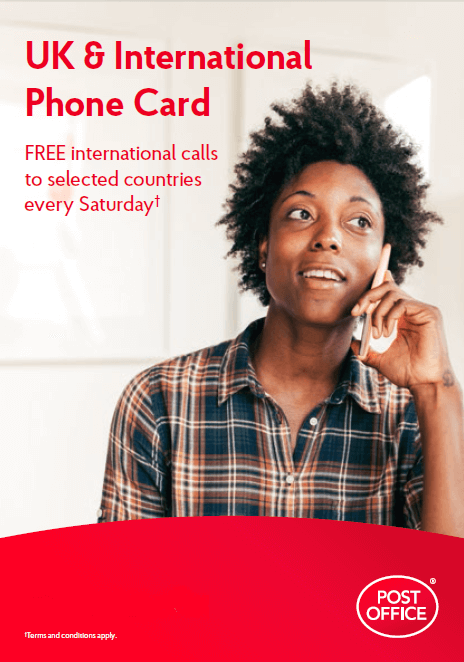 Here’s how you can save money on international calls with a Post Office UK & International Phone Card. Call rates to some of our more popular destinations are listed below. For a full list of countries please see our Price Guide. Every month, we also offer free or special rates to certain destinations to make catching up with friends and family even more rewarding. See below for 2018/19 special offers. Pick up a phone card from any Post Office branch. They’re available in £5, £10 and £20 denominations. You’ll find a unique PIN and two access numbers (beginning 0800 and 020) on the back. Make sure you know which is the right access number for you before you dial it. Just so you know, we round up rates in pence-per-minute to two decimal places and include VAT. And if you call an international mobile or non-geographic number (one that isn’t linked to a specific place, like 0870 in the UK), the rate won’t be the same as the one shown above. Depending on what access number you use there may be an additional surcharge if calling from a UK landline or UK mobile. See below. 0800 - Use this Freephone number to avoid being charged by your service provider. A surcharge may apply depending on how you place the call to cover charges imposed on us by operators. A 1p per minute surcharge will apply when calling from a landline unless you’re calling one of our free Saturday weekend destinations. From a mobile, a 4p per minute surcharge will apply including when you’re calling one of our free or special rate Saturday destinations. 020 - Use this number if you’re calling from a mobile phone or UK landline with inclusive UK minutes on your tariff. Do you have connection or service charges? Is there a limit to the number or length of special rate/free calls? When can I use the special rate and free call offers? Every Saturday, between noon and midnight GMT, you can call some countries for free. The countries will change each month. Special rate calls are also available all day on a Saturday. I have a problem with my card. What should I do? If you have a problem, don’t worry. We’ll be able to access your call records and get everything sorted as quickly as we can. Just give us a ring on 0330 001 0111 between 7am and 10pm. Calls to 03 numbers cost no more than calling a standard geographic number starting with 01 or 02 from your fixed line or mobile. They may be included in your call package; please check with your service provider. When do Post Office phonecards expire? £20 Post Office phonecards expire 90 days after they’re first used or when you have used all your credit making calls. Can I always get through to the countries I need to? Are there any numbers I can’t call? Some international calls may also be restricted if they are to premium rate or non-geographic numbers abroad. For more information please call us on 0330 001 0111. How much does it cost to call from a payphone? Can I use a Post Office Phonecard with a mobile phone? How much will it cost? From a mobile, a 4p per minute surcharge will apply including when you’re calling one of our free or special rate Saturday destinations. At the voice prompt, enter the PIN on the back of the card. At the next voice prompt, just enter the number you’d like to call. Your mobile phone operator may charge you for calling our 020 access numbers unless you have inclusive minutes. Once you’re connected, the cost of the actual call will be deducted from your phonecard credit at our rates. †Free calls to selected countries apply when placing a call on Saturday using either the 020 or 0800 access number. There will be a 4p per minute surcharge if you use a UK mobile to call a Free destination between 12 noon and midnight GMT or a 1p Saturday destination, using the 0800 access number. The 0800 access number surcharge from a mobile will also be charged when using the free call promotions. 0800 Freephone access is not available from public payphones. All calls will be rounded up to the next minute. Rates apply from March 2018 and may change without notice. If you’re using the BT basic user scheme, you may not be able to use the service. If you find you cannot use the 0800 access number, you may be able to use the 020 access number. Post Office International Phonecards are for use in the UK only. £5 and £10 Phonecards expire 60 days after they’re first used. £20 Phonecards expire 90 days after first use. Calls to international mobiles other than those indicated and non-geographic numbers may be charged at a different rate to that of the country. You can’t use Post Office Phonecards to call premium rate numbers. Phonecard/Credit Vouchers – Sold by Post Office Limited as an agent. Service supplied by AQA Telecom Ltd. company registration number 08932279, a UK company who both issue and redeem this voucher.